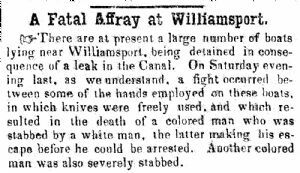 A Fatal Affray at Williamsport. There are at present a large number of boats lying near Williamsport, being detained in consequence of a leak in the Canal. On Saturday evening last, as we understand, a fight occurred between some of the hands employed on these boats, in which knives were freely used, which resulted in the death of a colored man who was stabbed by a white man, the latter making his escape before he could be arrested. Another colored man was also severely stabbed.